Protesters chant slogans during a demonstration over what they say is unfair distribution of wealth in the country at Meskel Square in Ethiopia's capital Addis Ababa, Aug. 6, 2016. The death toll from weekend protests in Ethiopia has climbed to nearly 100, by some accounts. Hundreds of people have also reportedly been arrested and many have been injured. Protests in the Oromia and Amhara regions on Saturday and Sunday left dozens dead and hundreds injured. Amnesty International puts the number of fatalities at 97. Opposition parties and human rights groups say Ethiopian security forces opened fire on anti-government protesters who were unarmed and peaceful. Despite their simultaneous demonstrations, the Oromo and Amhara do not have the same grievances, says Fisseha Tekle, a human rights researcher at Amnesty International’s regional office. Protesters chant slogans during a demonstration at Meskel Square in Addis Ababa, August 6, 2016. In the Oromia region, people began protesting in November 2015 against a government “master plan” that would annex parts of their land to Addis Ababa, the capital city. The plan was officially put on hold, but people have still been demonstrating. In the weekend violence, Amnesty International says at least 67 people were killed in 12 cities and towns. In the Amhara region, reports suggest at least 30 people were killed in the capital, Bahir Dar, over the weekend. The opposition had cancelled a planned rally after saying officials did not give authorization, but protesters still came out to support the Oromia people and ask the government to address local issues. 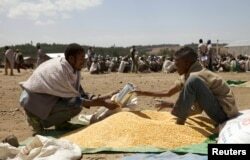 FILE - A farmer receives grain at an emergency food aid distribution in the village of Estayish in Ethiopia's northern Amhara region, Feb. 11, 2016. One grievance had already surfaced in July, when security forces tried to arrest a leader of the Wolqait Identity and Self-Determination Committee on alleged terrorism charges. The Wolqait administrative district was formerly part of the Amhara region until 1991, when the ruling party took charge. In subsequent years, it has demanded reintegration. Fred Nyabera works with child anti-poverty group Arigatou International. He believes that the common bond between the Oromo and the Amhara is their inability to express the grievances to the government. “I think partly, according to my thinking, is that there’s been a shrinking space for civil society organizations and alternative voices in Ethiopia generally. And people might have different grievances but they don’t have a place to air it out,” he said. Awol Allo, a fellow in human rights at the London School of Economics, says that the groups are now starting to come together, after historically being pitted against one another. “But what really happened over the course of the last one year is that people on both sides tried to come together and sort out the things that prevent them from having a conversation with one another so there are already very interesting expressions of solidarity between the Oromos and the Amharas,” said Allo. But no one, including Amnesty’s Fisseha Tekle, is quite sure what the future will hold. The government continues to warn against protests, which it says could lead to destabilization.